A few years ago, my husband and I were in Israel. On our last day in country we went to Jerusalem. While there, we experienced Hezekiah’s Tunnel. 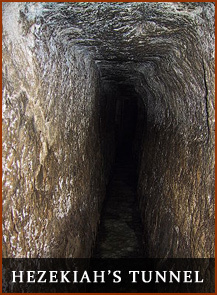 This ancient Judean underground waterway was a part of King Hezekiah’s survival plan against Assyrian siege tactics. Today the Tunnel is a trek for the brave…not dangerous, but very challenging. We overcame our natural claustrophobia, and came out in one piece, after sloshing through water…ducking 5′ ceilings, and squeezing through the narrow walls. The pitch black, 1/3 mile trek, required 100% trust in the leader. The only explanation for this trust, is the relationship already built with our guide. He had been reliable through many hikes…always showed us the safest paths, and encouraged us to attempt new experiences. For the Christ-follower, Jesus is the ultimate Guide. He knows the ways ahead, and is building a relationship of trust, through His faithfulness to us, in life’s difficult days. He knows what we can handle today…and what we’ll need to handle tomorrow. He has exciting experiences for us…if we’ll lean and allow Him to lead. This entry was posted in Uncategorized and tagged Hezekiah's Tunnel, trust. Bookmark the permalink.